The term ‘English Rose’ is the name David Austin has given a new rose variety that originated from the crossing of old roses from the 18th and 19th century (Gallicas, Damasks, Portlands and Bourbons) with modern roses (Hybrid Teas and floribundas). English roses were first introduced in 1969, although there were three earlier varieties (‘Constance Spry’ in 1961, ‘Chianti’ in 1967 and ‘Shropshire Lass’ in 1968). They combine the flower shape, scent and the general character of the old roses with the wide range of colors and repeat flowering of the modern roses. David Austin started experimenting hybridizing roses in the 40’s and 50’s of the previous century. 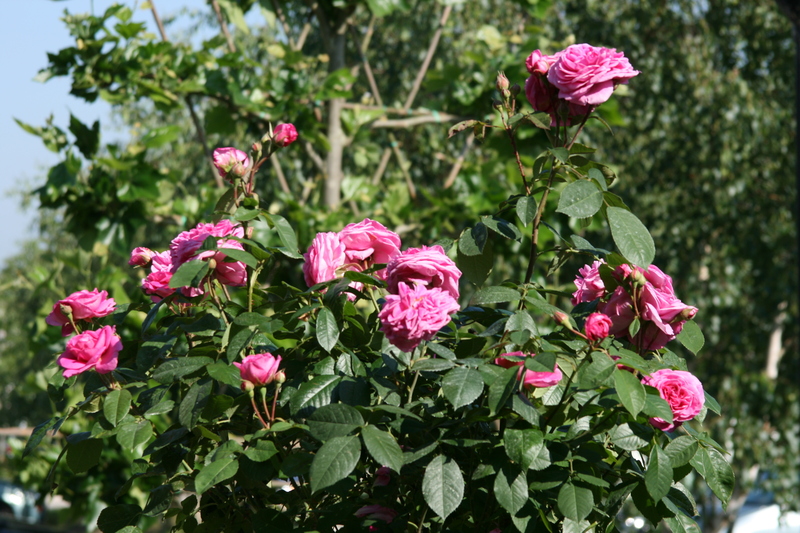 Shortly after World War II, he bought the rose ‘Stanwell Perpetual’ of the nursery Bunyards in Kent where Edward Bunyard had amassed a small collection of old roses. This rose was found in a cottage garden as a spontaneous seedling which flowered early, and next repeatedly until early winter. The double flowers are soft pink with a lighter underside and have a somewhat messy, but beautiful old-rose appearance. Austin used as his first parent the small Gallica rose ‘Belle Isis’, which he crossed with the Floribunda ‘Dainty Maid’. Among the seedlings of this crossing, there was one that stood out, and which turned out to be the summer-flowering climbing rose ‘Constance Spry’. Next followed an intensive breeding program and by 1969 he had a small group of roses ready for release. (David Austin English Roses). English roses need little pruning other than the removal of old or dead wood in winter and shortening of very long shoots; as with most roses they do best when very well fed with a generous mulch of manure.